If you’ve been poking around the site lately, you’ve undoubtedly noticed how slow it’s been. I’ve delayed posting some reviews because of this, but all should be well now. It was part hosting issues and part database issues. With a site as old as the HSB, there was a ton of old tables in the database taking up more space then needed and the host just couldn’t keep up. Everything should be straightened out now – or on it’s way. If you are still experiencing issues, please let me know so that I can sort that out. The bed spread matches the wallpaper. 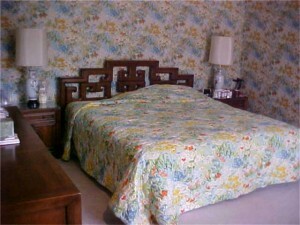 Which also matches the drapes that you can’t see in this photo. Lot’s of demolition in our future – so much so that we’re not planning to move until February, even though we’re closing this month. Anyone interested in taking out some frustrations with a sledgehammer, just let me know! Plans are to gut just about everything, keeping only the basic foot print and updating to functional status as well as “won’t burn down if you plug a computer in” status. The joys of home ownership! My major goal: get the garden ready for planting asap – I’ve been without a green area for long enough. Regularly scheduled reviews resuming asap. Hi, i am trying to get into this hot sauce business. My dad bottled his hot sauce and sent it to me. I got my first shipment of 12 bottles yesterday. We sold the first one and was told that it exploded. I opened the other 11 and 9 of those exploded as well. Only two were explosion free. The question here is…is it still safe to consume as there still is enough hot sauce in all the bottles or do i have to discard. They are in the fridge as we speak. I’m not sure if you consider covering these types of projects or posts, but wanted to reach out in case it’s an option or of interest for a story on a sauce start up… We’re creating our own specialty sauce in Alexandria, and just launched this campaign. I imagine some of your readers would be interested in learning about the spicy ketchup. I’m glad to do a short interview with anyone who may be interested in learning more.